As February blows in, we find we’ve got a busy month ahead of us at Pleasant Valley United Methodist Church! More details can be found in our church newsletter, The Link, which can be viewed by clicking on The Link tab at the top of the page, but some highlights will be shared in upcoming posts. 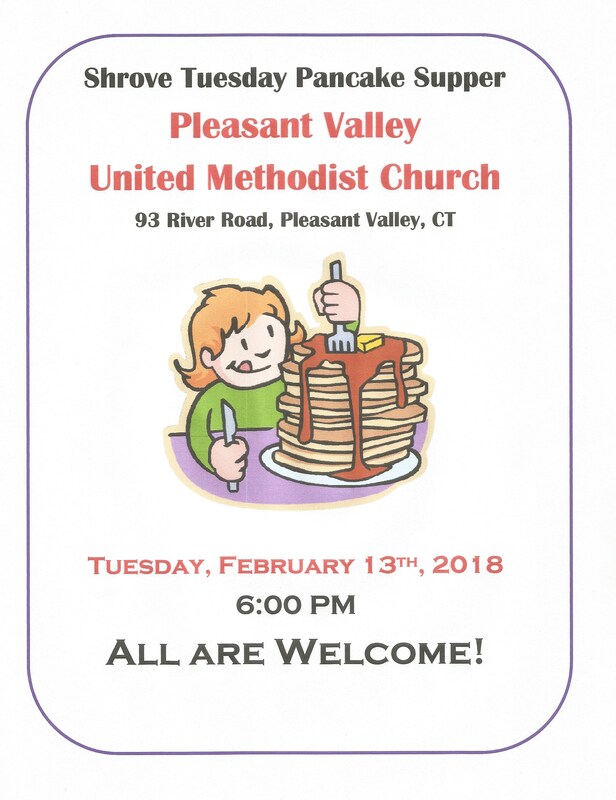 On Shrove Tuesday, we will celebrate with our annual Pancake Supper. The men of the church are the chefs and they provide a delicious selection of “breakfast for dinner” treats, including a variety of pancakes, sausage, and REAL maple syrup! The fun starts at 6:00 pm and is open to anyone who would like to come. Although there is no charge for the meal, a ‘good-will offering’ jar will be available should you wish to help out with expenses. Come join us for a fun event! !